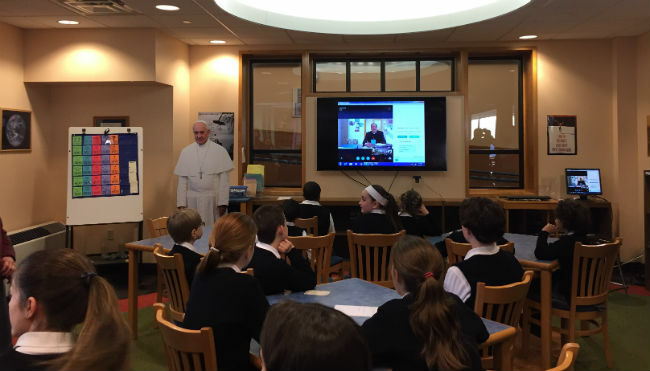 Philadelphia Auxiliary Bishop John McIntyre leads a video conference Monday, March 2 to congratulate the Ancillae-Assumpta Academy school community on winning the World Meeting of Families Creative Video Contest. 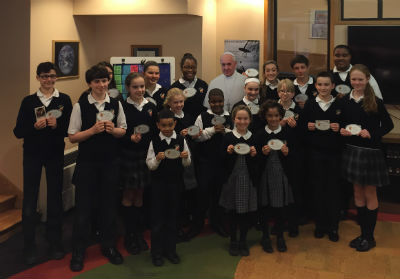 Student Council members representing Ancillae-Assumpta Academy show some of their World Meeting of Families car magnets and a cut-out image of Pope Francis on Monday, March 2 at the school. Four schools in the Archdiocese of Philadelphia were announced as winners in the World Meeting of Families Creative Video Contest. Almost 5,000 votes were tallied to select the videos submitted from across the United States that best demonstrated how Catholic school communities can apply faith, knowledge and service to create a family fully alive. Ancillae-Assumpta Academy in Wyncote took first-place honors in the contest. Second place went to St. Dorothy School in Drexel Hill, and St. Hilary of Poitiers School in Rydal placed third. Our Lady of Angels Regional School in Morton received an honorable mention. Additional honorable mention videos included McGill-Toolen Catholic High School, Mobile, Ala.; Serra Catholic School, Rancho Santa Margarita, Calif.; St. Patrick Catholic School, Louisville, Ky.; Holy Trinity Catholic School, Lenexa, Kan.; and St. Anne’s Catholic Home School Community, Hamel, Minn.
Auxiliary Bishop John McIntyre congratulated the school, represented by student council members, during a Skype video conference on Monday, March 2. As the winning contestants, students won a life-size Pope Francis cutout and hundreds of World Meeting of Families car magnets. These contestants will be invited to share their videos at the World Meeting of Families in September. Watch all the videos on the website of the World Meeting of Families.